Today I’ll tell you a funny stupidity, the Bohr radius. Although it may not have much to do with physics, quantum physics, the Planck constant and, above all, the distance of Planck have much to talk about or draw on it in principle. It is the Bohr radius. And in Bohr’s atomic model or classic model we all know, and take for valid study shows an orbital view of what is an atom. In this model, proposed by Bohr in 1913 a positive nucleus (positively charged) surrounded by an electron or electrons that orbital negative charge around the nucleus is postulated. 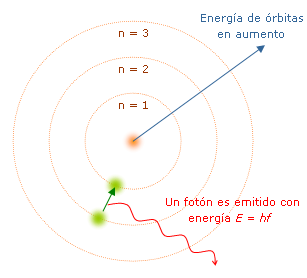 Bohr’s model is intended not only to understand how an atom but mainly to explain the energies of the electrons works. And this is where the beauty comes because this halfway between quantum mechanics and classical mechanics, c’mon, links them. If we consider an electron spinning in an orbit around a central core that also is vibrating in a wave function, as explained by quantum mechanics where all elements can “draw” through a wave that characterizes (so we understand), the electron is radiating energy (you know, heat, energy, more heat more vibrates, then if it vibrates ejected waves and thus energy). This contradicts the classical mechanics as the electron, to be losing power, would be attracted continuously falling on the core (by the electrodynamic force, let the positive charge). In addition, the energy continuously emitted when approaching the electron to the nucleus emitted at a wavelength us would if we take the issue of an atom this would be at all frequencies as to be decreasing energy continuously spectrum would issue continuous and infinite. And milk, this is not because we are alive and not disintegrated, then something is wrong. Well, Bohr and Planck (especially the last) observed that the spectra were not continuous but measurable (with jumps). And why they were jumpy? … Because Bohr, thanks to the Planck constant and using the macroscopic angular momentum achievement calculate the energy levels of electrons in atoms. Quite an achievement. Hence his model of the atom where the level of minimum energy hydrogen electron is the Bohr radius.